A Pig Island Bahamas tour will allow you to explore the site of the famous Swimming Pigs, which has developed into one of the country’s most popular attractions. These delightful animals have swum their way into the hearts of people across the globe, and a swimming with pigs Bahamas excursion has become the world’s most sought-after trip! 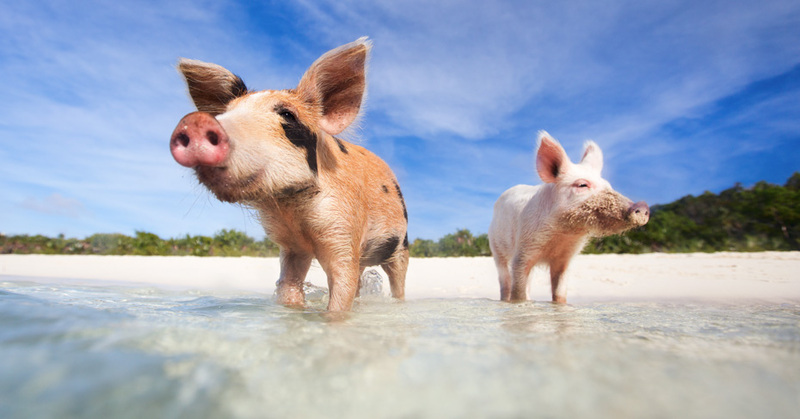 Embark on a journey into the Caribbean for a Pig Island Bahamas tour! A swimming with pigs Bahamas tour is a remarkably unique experience. Whether you choose to stroll along the crisp white sand on your Pig Island Bahamas tour, or to actually swim alongside these paddling porcines, your swimming pigs tour will certainly be unforgettable. To ensure that you get some one-on-one time with these wonderful creatures, you should bring some food for the pigs with you on your Pig Beach Bahamas tour. If you are intending to enjoy a swimming with pigs Bahamas excursion, then you should certainly visit the Exuma Cays. The Swimming pigs are located nearby Staniel Cay in the Exuma Cays which means that you will also be able to enjoy the wondrous scenery and attractions of Staniel Cay on your Pig Island Bahamas tour. However, if you’re on your way to the Abacos islands instead of an Exuma Pigs tour in the Bahamas, then a swimming pigs Bahamas tour will still be possible. There is smaller population of pigs located on a small island near Green Turtle Cay which is affectionately named “Piggyville” by locals. The Exuma Cays are a string of 365 isles in the Out Islands of the Bahamas. Apart from the unique wildlife that can be found here, these islands display an incredibly pure beauty, showcasing the Bahamas unspoiled. Big Major Cay can be found in the Exuma Cays and is more commonly referred to as Pig Island by locals. The island closest to Big Major Cay on your Pig Island Bahamas tour is Staniel Cay, which serves as a brilliant hub to explore many of the nearby attractions including a swim with pigs excursion. Exploring the Exuma Cays is made easy by boat, which will allow you to make the scenic and exhilarating journey across the beautiful turquoise water to Big Major Cay on your Pig Island Bahamas tour. The moment your boat pulls into the bay is the moment your Pig Beach Bahamas tour kicks off. As you drift closer to the beach, a number of the pigs will actually swim out to meet you, providing the very best welcome to your swimming pigs tour that you could wish for. The snouts of the pigs will all be raised hopefully, and you’ll have your chance to feed them as they paddle alongside the boat. Many people believed that these pigs came to be on this island as a result of a nearby shipwreck. It was not uncommon for sailors to travel with livestock on their ships as a source of food decades ago, and it was said that perhaps one of these ships had run aground and the pigs had washed up on a nearby coastline. While it’s fun to speculate about all the different ways in which the pigs may have landed up here, the truth is that they were brought here by the residents of a village on a nearby island many years ago because of their smell. Discover the Exuma Pigs on our Bahamas Day Trip or Bahamas Island hopping tour. Located just to the east of Southern Florida, the Abacos are a string of islands and cays that span a length of around 120 miles. These exquisite islands are generally known for having some fantastic scuba sites where you can share the water with some truly fascinating creatures including turtles, eagle rays and even some sharks. However, one of the most popular animals to visit in the Abacos are in fact the swimming pigs of No Name Cay, which are just as entertaining as those on a Pig Island Bahamas tour. While there may not be quite so many pigs in “Piggyville” as opposed to the thriving population on Big Major Cay, these pigs are just as exciting to visit as the ones you see on a Pig Island Bahamas tour. The island is known as No Name Cay, and you will have to island hop Bahamas from Green Turtle Cay to arrive here. While these may appear to be simple farm animals, a swim with pigs excursion of No Name Cay should include a level of caution. These pigs are wild animals, and while they may be friendly enough to waddle up for some food, they should still be treated with respect and tentative care. Your tour of the Abacos Swimming Pigs may also coincide with Craig Russel’s weekly visits as he takes care of the pigs, bringing them food and drinkable water. A Swimming Pigs Bahamas tour is a wonderful and unique experience whether you enjoy an Exuma pigs tour or you visit the pigs of the Abacos. This truly is the perfect addition to your day trip to Bahamas itinerary. Visit the Swimming Pigs in the Abacos on our Green Turtle Cay Bahamas Day Trip or our 2 Day Abacos Island Hopping Tour. The beauty of the Bahamas is how convenient a trip from Florida can be. The proximity of the Bahamas to the USA enables people to enjoy day trips in which they tour a number of the country’s most popular attractions. Whether you plan to depart from Orlando, Vero Beach, Fort Lauderdale, Palm Beach or even Maimi, you will have the chance to embark on a comprehensive tour of the Bahamas in a day. This, of course, will include the delightful swimming pigs of Big Major Cay and a Pig Island Bahamas tour. Booking with Bahamas Air Tours ensures you a Bahamas tour like no other, as you island hop your way through all of the most exciting and picturesque destinations. If you’d like to experience as much of the Bahamas as possible, you can also book a multi day to week long island hopping tour. On this tour, not only will you view some of the world’s most picture-perfect settings from the air as well as on the ground, you will also be able to visit both sets of the Swimming Pigs. Your tour will bring you directly to both Staniel Cay and Green Turtle Cay from where you can set off to experience the wonder that is the Bahamian Swimming Pigs. There truly is no better way to discover the beauty and wonder of the Bahamas than on a trip with Bahamas Air Tours. The Bahamas is a destination that is overflowing with unique attractions and wondrous sites. The experience of exploring this diverse and fascinating destination is immeasurably enhanced by booking an island hopping by air tour. Each new island brings with it a host of new and exciting experiences, and once you’ve discovered all that the island has to offer, you can set off once again in the small plane where every seat is a window seat. Viewing the Bahamas from above is a scenic experience like no other, with island after island slipping past beneath you as the endless turquoise ocean spreads out around you in all directions. Discover your perfect Bahamas destination with our informative guides to the Out Islands. Not only is choosing an air tour instead of a boat tour more picturesque, it is also far more convenient. The Bahamas is a unique destination in that almost every island is equipped with an airstrip. This means that your travel time will be cut down significantly by touring the Bahamas from above, and you’ll still have the chance to explore each island from the ground as well. Booking with Bahamas Air Tours will awaken the wonder of flight inside you once again. No more boarding queues, no more waiting in line for rigorous security checks, just a smooth and efficient trip from beginning to end. Whether you hope to visit the swimming pigs on a Pig Island Bahamas tour, or you want to visit the pigs of the Abacos, or even if you want to visit both, there is no better way to discover the famous swimming pigs of the Bahamas than on a trip with Bahamas Air Tours. Setting off on this scenic, fun-filled expedition will showcase the immense beauty and diversity of the Bahamas as a destination. Be sure to book your seat on a Pig Island Bahamas tour and take the first step towards an unforgettable vacation with Bahamas Air Tours! With beautifully illustrated maps and informative destination guides. Join the List. Sign up for deals!